ENGLISH FOLK SONG SUITE, composed in 1923, was originally given the title Folk Song Suite. When it was arranged for Orchestra in 1924 (and later Brass Band) by Gordon Jacobs (1895-1984), at that time a student of Vaughan Williams, the longer title was used. Ralph Vaughan Williams, composer, teacher, writer and conductor, was born on October 12, 1872 in Gloucestershire, England and died on August 26, 1958 in London, England. He studied at Trinity College, Cambridge and the Royal College of Music in London, where he met fellow student Gustav Holst (1874-1934), who remained a lifelong friend; he also played the piano, organ, violin, viola and studied composition with Hubert Parry (1848-1918), Charles Wood (1866-1926), Charles Stanford (1852-1924) and, in Berlin in 1897, Max Bruch (1838-1920) and Maurice Ravel (1875-1937) in Paris, in 1908. Vaughan Williams did not use Opus numbers to identify his compositions and was constantly revising them. He composed for almost every possible medium: several Operas & Ballets; numerous choral works; 8 Symphonies; Concertos for Piano, Violin, Viola and Tuba; incidental music for many stage plays, including 5 by Shakespeare; music for radio and 11 movies. In addition to English Folk Song Suite (1923), he composed other works for band: Sea Songs (1923), Toccata marziale (1924) and Variations (for Brass Band, 1957). The original Folk Song Suite premiered on July 4, 1923 and had 4 movements; the 2nd movement, Sea Songs, was removed by Vaughan Williams after the first performance and published separately, later that year. 1. March, after a four bar introduction, begins with the folk song Seventeen Come Sunday (5-30), followed by Pretty Caroline (32-63), then Dives and Lazarus (65-96) in the lower instruments with a 6/8 counter melody in the upper woodwinds. The formal structure of the piece is: A-B-C-B-A (A is Seventeen Come Sunday; B is Pretty Caroline; C is Dives and Lazarus). 2. Intermezzo uses the folk songs My Bonny Boy (2-42) and Green Bushes (43-77). 3. March, after a four bar introduction, begins with the folk song Blow Away The Morning Dew (also known as The Baffled Knight; 5-28), followed by High Germany (29-44), then a reprise of Blow Away The Morning Dew (55-88). The TRIO changes both key (adding one flat) and meter (from 2/4 to 6/8) and begins with The Trees So High (3-18), then changes back to 2/4 with John Barleycorn (19-42). In this arrangement as a Sonata for Flute and Piano, as much as possible of the Solo Flute band part has been retained and the part has been marked to indicate the original source (Woodwinds, Brass, etc.). 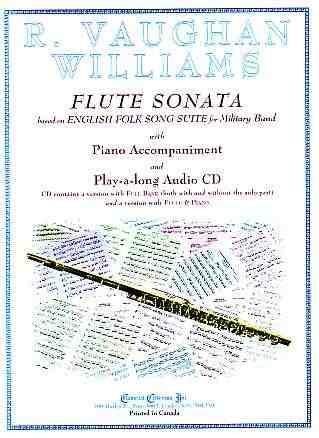 This makes the Sonata ideal for any flutist who is studying or performing the English Folk Song Suite, to better play, understand and, in general, enjoy the wonderful music of this outstanding piece!